Have you ever wondered why there are so many pubs, streets, and even a province in Canada called “Prince Edward-something" or “Duke of Kent-something”? Most of them are named in tribute to a well-known resident of Halifax, Prince Edward, Duke of Kent and Strathearn (1767-1820). Edward was the first member of the British royal family to live in North America for an extended time, so it’s not surprising British colonists were eager to show their appreciation by naming things after him. Prince Edward Augustus was the fourth son of King George III (1738-1820) and Queen Charlotte of Mecklenburg-Strelitz (1744-1818). Edward entered into his military career at age 17, and quickly became known for his very strict military discipline. He also gained a reputation for racking up mistresses and debts, much to the king’s displeasure. He was stationed at Halifax as military commander of New Brunswick and Nova Scotia from 1794-1798 and as commander-in-chief of the forces in British North America from 1799-1800. Prince Edward did not live long enough to inherit the throne, but his daughter became the long-reigning Queen Victoria (1819-1901) after the death of William IV (1765-1837). Last year while doing research for the Library's Canada 150 community albumopens a new window, I was struck by the very large architectural fingerprint Prince Edward left on Halifax. In his time here, he was involved in the planning and construction of many of the iconic downtown buildings I walk past every day, including St. George’s Church and the fort and town clock at Citadel Hill. Edward was fond of Palladian architecture, a classically inspired style which was very popular through the seventeenth century in Britain. 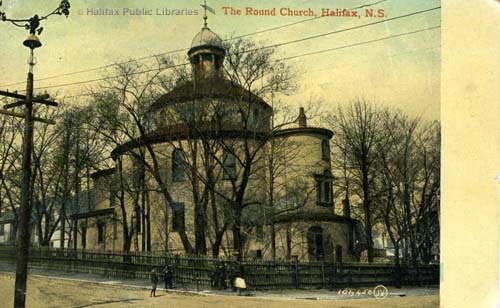 He also had a strong penchant for round buildings: St. George’s Church (pictured below), Martello Towers at Point Pleasant and York Redoubt, and the unique Music Room rotunda (pictured above) you can see from the Bedford Highway were all commissioned by him. 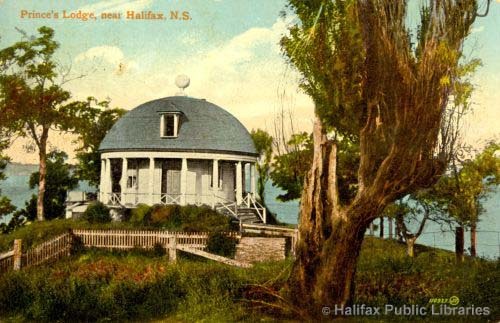 The Music Room is the only remaining building of the Prince’s Lodge, the estate Edward leased from Lieutenant-Governor John Wentworth (1737-1820). Edward lived on the estate with his long-term mistress Thérèse-Bernardine Montgenet, who was also known as Julie de Saint-Laurent (1760-1830). Mme de Saint-Laurent accompanied Edward to Canada to run his household and provide “companionship”. She remained with him for 28 years until he married in 1818. The site of the Prince’s Lodge is now Hemlock Ravine Park. The unusual heart-shaped pond there was commissioned by Prince Edward as a romantic tribute to Mme Saint-Laurent. For further reading on Edward’s life in Canada, I recommend: Nathan Tidrige’s recent biography Prince Edward, Duke of Kent: Father of the Canadian Crown; and William D. Naftel’s Prince Edward’s Legacy - the Duke of Kent in Halifax: Romance and Beautiful Buildings, a lovely illustrated work on the impact Prince Edward had on the Halifax landscape. Find other works about the Prince and Mme de Saint-Laurent in our collection and when you visit our Local History Room at Central Library.